"Contains material originally published in magazine form." Paperboy blues / by Chris Giarrusso -- Cereal quest / by Chris Giarrusso -- Paperboy showdown / by Chris Giarrusso -- Spidey and his amazing co-workers / written by Sean McKeever -- Civil wards : a Mini Marvels event in four parts / written by Marc Sumerak -- Civil wards : a Mini Marvels event in four parts. Pt. II, "A line in the sand" / written by Marc Sumerak -- Civil wards : a Mini Marvels event in four parts. Pt. III, "Whose slide are you on?" / written by Marc Sumerak -- Civil wards : a Mini Marvels event in four parts. Pt. IV, "The final part" / written by Marc Sumerak ; co-written by Chris Giarrusso -- Principal Stanley / by Chris Giarrusso -- "Lo, there shall come -- a go-cart" / written by Paul Tobin -- Armageddon unleashed / written by Paul Tobin -- Hulk date / story and art by Chris Giarrusso -- World war Hulk. Pt. 1, Round trip / by Chris Giarrusso -- World war Hulk. Pt. 2, Rally the troops / by Chris Giarrusso -- World war Hulk. Pt. 3, Final showdown / by Chris Giarrusso -- Hulk art class / written by Audrey Loeb ; art by Chris Giarrusso -- Hulk splash / written by Audrey Loeb ; art by Chris Giarrusso -- Hulk zoo / written by Audrey Loeb ; art by Chris Giarrusso -- Hulk web / written by Audrey Loeb ; art by Chris Giarrusso -- Hulk airport / written by Audrey Loeb ; art by Chris Giarrusso -- Hulk ice / written by Audrey Loeb -- Hulk beach / written by Audrey Loeb ; art by Chris Giarrusso -- Hulk mama / written by Audrey Loeb ; art by Chris Giarrusso -- Hulk chef / written by Audrey Loeb ; art by Chris Giarrusso -- Repulsive manner / story & art by Chris Giarrusso -- Birthday gift / story & art by Chris Giarrusso -- Third person / story & art by Chris Giarrusso -- Overdue / story & art by Chris Giarrusso -- Black cat / story & art by Chris Giarrusso -- The itch / story & art by Chris Giarrusso -- The couch / story & art by Chris Giarrusso -- The French bread / story & art by Chris Giarrusso -- Giant Girl / story & art by Chris Giarrusso -- The snowman / written by Sean McKeever ; art by Chris Giarrusso -- Mini Marvel classics / story & art by Chris Giarrusso -- Passing the torch / story & art by Chris Giarrusso -- Welcome back Thor / story & art by Chris Giarrusso -- The Iron Avengers / story & art by Chris Giarrusso -- The insult that made an Iron Man out of "Max" -- Conspicuous invasion / story & art by Chris Giarrusso -- Hawkeye and the beanstalk / story & art by Chris Giarrusso -- Hawkeye and the curse of the crimson crown / written and illustrated by Chris Giarrusso. All-ages fun featuring the wild and crazy kid counterparts to Marvel's greatest heroes! Spidey gets the paperboy blues, Wolverine goes on a cereal quest, Hulk goes on a date and the Fantastic Four are impersonated by alien Skrulls. Iceman and Firestar help Spidey deliver his newspapers while he babysits Power Pack. Thor returns, Iron Man builds armour for the Avengers, and Hawkeye squares off against Galactus. And where did Red Hulk and Blue Hulk come from anyway? 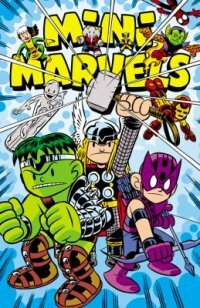 Plus: a complete run of Mini Marvels classic comic strips. New York : Marvel, 2013.